According to the original plan we wanted to reach kazaa on this day and spend more time at Chandertal the next day. This was not to be. We got up late (by Joshi’s standards) and had a leisurly breakfast and it seemed that even God was not with Joshi that day because it was pouring cats and dogs. And we all had a problem … Now we’d have to tackle the rain along with the potholes. But we were prepared for it … or so we thought. We filled up our tanks at a non-descript place and braced ourselves for the journey ahead. The next petrol pump was only at Kazaa and we were all running short on petrol. We had a lot of firsts on this day: Our first water crossing, Our first landslide like experience, First bouts of AMS and breathlessness and the first awesomely beautiful waterfall. The landslides story is a funny one. 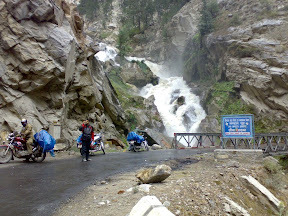 We had just crossed the slush ridden part of the road after Karcham and it seemed that the weather was opening up. Ashok and Amar were ahead of us all and Sandhu was following them. Both of them crossed a narrow section of the road, stopped and started waiving at us. Sandhu, didn’t see that and continued on that section of the road and he saw the waiving only mid-way through that section. So, guess what did he do ? He stopped 🙂 For a second and then they came .. shooting stones ! A couple of them hit him on the helmet and that was when he realised the reason why both Ashok and Amar were waiving at us like maniacs 🙂 So, they weren’t asking him to take their snap or something .. they were asking him to STOP ! But it was too late by now and all Sandhu could think of was engaging the first gear and run from there … run like hell ! 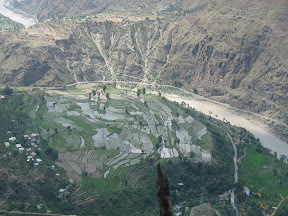 This was also the day when we saw the lush green landscape transform into an arid moonland. The trees were gone, the greenery was gone and all we could see was the brown (!!) Satluj river the and mountains which were all shades of brown. We reached Nako at around lunch time and had a hearty lunch. The dal chawal were actually quite tasty. 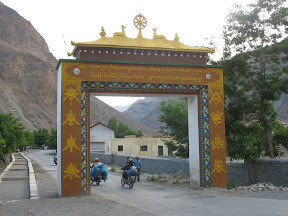 Nako has a small monestary as well as a natural lake both of which are quite popular with foreign tourists, which would explain the presence of the large number of hippy looking dirty foreigners in that small village. We decided to skip seeing the Nako lake as we were getting late and it didn’t look like we would be able to reach Kazaa anyway by evening. We reached Tabo around 5 in the evening and decided to stay there for the night since Kazaa was another 50 kms and that could have taken another two to four hours on those roads. It was a good decision as, it turns out, Tabo is known for its monestary which is among the oldest in the region (around 900 years) and unlike the other monestaries is situated at ground level so we didn’t have to climb any mountains to see it. The monestary is made almost entirely of mud. Did I mention the monestary is an encridbly beautiful sight ? Ok … I’m late, I know … but the elusive (and mandatory) trip log of our trip to the himalayas is finally here. 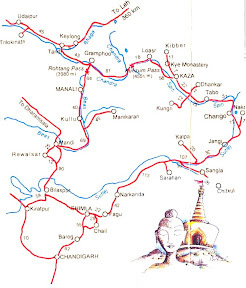 Chandigarh – Spiti – Leh – chandigarh, all 3000 kms of it. And on top of all that was happening I had got a new job in a new city and had to join about 10 days before the start of the trip. My plans would have been in jeopardy if my new-to-be boss hadn’t agreed to grant me two weeks of leave if I joined early, which I did. So, with my leaves taken care of, I just had a couple of small things to do and then I’m off. Right ? Wrong. It turns out that finding a house on rent is quite difficult in a new place, and when you don’t know the local language, the whole process can turn into a nightmare pretty soon. But I had 10 days with me, I thought, that should be enough to find a decent house, since I had pretty much zeroed in on the area I wanted to live in. Right ? Well, guess what, wrong again ! My wife and I saw about 50 houses in those 10 days and rejected each one of those and had *almost* selected a house (more due to lack of choice than love for the house) and I left for Delhi with that. Btw, my wife finally decided on a house two days after I was gone, and it wasn’t the one we had shortlisted, infact this was a different one altogether. Enough said, this isn’t about my house hunting escapades, so I’ll move along to the actual trip. I took the early morning .. correction … really early morning flight to Delhi and landed in Delhi at 8:15. Went to gopinath market to check out a pair of waterproof boots. Found them a bit uncomfortable so decided to let go and go ahead with just the two pairs of sneakers that I had. Which turned out to be a not so great idea. I’d been in touch with Sandhu who had been in touch with the transporters who had got the bike and apparently there was confusion. The gist is that the one bike had reached Chandigarh with a couple of problems and other other one somehow landed at Ambala. Anyway, Sandhu took care of that (with the help of a lot of Punjabi expletives) and we had the bikes in Chd ready for the journey ahead. There was a slight problem, though. My bikes stay had cracked and Sandhu’s bike’s silencer had to be replaced. Sandhu along with joshi and Ashok, who had reached Chandigarh in the afternoon, took care of that too (lucky me) and we had the bikes finally ready for the journey ahead. We reached Narkanda safe and sound in time for Lunch. Stopped at the HPTDC resort for Lunch and devoured a couple of chickens and were back on the road soon. The resort has nice views of the valley, btw. We still had a couple of hundred kms to cover and the roads weren’t helping our cause a bit. This was also when we kinda stopped complaining about the roads. They weren’t going to get any better anytime soon, it seemed. We had the Satluj for company all this while and the awesome view of the valley was, well, awesome indeed. 29th June: Reach Chandigarh, get bikes checked and fill petrol. 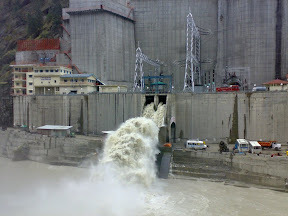 30th June: Leave early morning, reach Karcham by evening. Night halt at Karcham. 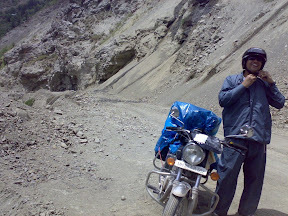 1st July: Karcham to Kaza. Visit monestary at Tabo. Kaza has the highest petrol pump in the world. 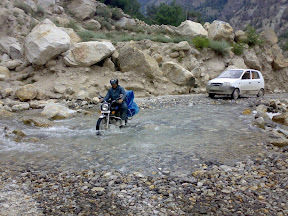 2nd July: Kaza to Chandertal. Visit Kye monestary and Kibber village enroute. Cross kunzum la. 3rd July: Chandertal to Keylong. Get fuel topped up at Tandi, the last pump till Leh. Get bike checked at Keylong. Halt at Keylong. 4th July: Keylong to Pang. Halt at the Pang transit camp, the highest in the world. Cross Baralacha la, climb up Gata loops. 5th July: Pang to Karu. Halt at Karu. Cross More plains. 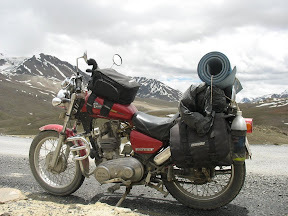 6th July: Karu to Pangong Tso. Night stay at Tangtse. Cross Changla. 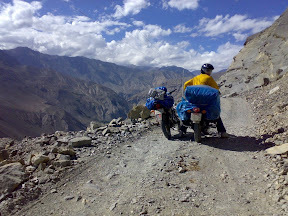 7th July: Tangtse to Leh. Cross Changla. 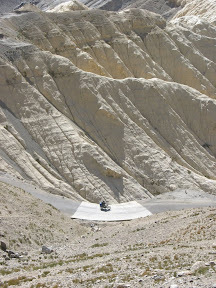 9th July: Leh to Khardung la and back. 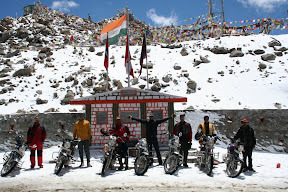 The highest motorable pass in the world. 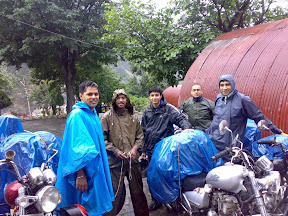 10th July: Leh to Kargil. Cross Fotu La. 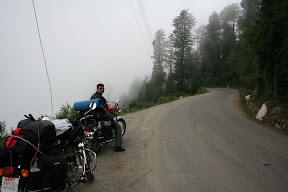 11th July: Kargil to Srinagar. 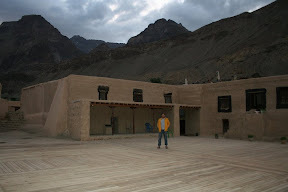 Cross Zoji la, Dras, second coldest inhabited place in the world. 12th July: Srinagar to Pathankot. Cross Jawahar tunnel, 2.8 kms long. 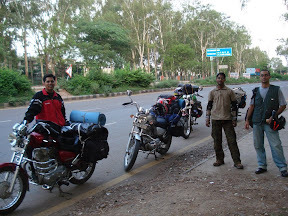 13th July: Pathankot to Chandigarh.